Never. Absolutely not. I can't let you see the prizes early, that's just CRAZY talk, I tell ya! Never, ever, under ANY circumstances -- Alright, you convinced me. Let's take a look at them! I'm over here talking to Token Taker Ted, eh? He's loading up the tower with the newest truckload of prizes, and I just ask him to slip us a few little sneak peeks. He wasn't having it, something about how it's in the ToonFest rules that I wrote and all that hullabaloo. So I said HULLABALOO to the rules! Leave it to Ted to give me just the response I was looking for: "I can't argue with that!" These bears are the real heroes, let me tell you. Let's bring in those prizes! You know it wouldn't be ToonFest without my very best bowties, and boy were they a hit last year. We're bringing in some all new designs for the more dapper Toons around town who wish to switch up their selection, of sorts! Just no stealing my style, you see? Planter hats -- they're all the rage for gardeners, you know. 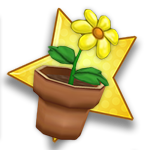 The most popular style in all of Daisy Gardens, too! This isn't just a drop gag that you wear on your head, though -- HAH I'm just playin'! It actually is! Take a look at this shiny new shirt! I don't know what's up with you all and wanting a Hawaiian shirt so badly. 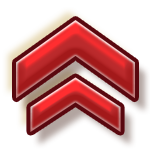 In fact, it was requested so much it's as if you had already seen this design before. You aren't spyin' on my ToonFest tailors, are you? 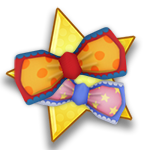 We've got a brand new type of prize making it's way to the ToonFest grounds soon, too... Boy are you gonna want to stockpile your tokens for this one! I'll give ya three guesses what it is, and I'm not answering a single one of them. Hope you enjoyed these HIGHLY exclusive prize previews -- gives you a bit of torque to your token, eh? HAH! Keep your cannons crashing, because these prizes are coming out soon! Excited for the Hawaiian Helper and the Flower Pot Top! Toontastic! I can't wait to see all the prizes! Thank you for bringing back the Hawaiian Helper shirt! I better stock up on those tokens more! I hope we get to have these items in-game and I hope we get to see what the mystery multiplier does. Yes! We get completely original clothing and accessories for this year! Excited to save up for all of the prizes! Also, Multipliers... Experience Multipliers? I wonder what the Merry Multipliers does. Anyways excited for these items! I can't wait! These are so good i'm literally turning into a firework! OOO, love the bows, flower pot top and shirt! Can't wait, I better get hopping for more tokens, lol. When will special toontasks come? I am excited for them and Hawaiian Helper T-shirts! So excited! Can't wait for the bows and bowties! love the little flunky on the shirt! Really looking forward to the new bowties! They match well with any outfit! I am so excited about the Merry Multiplier. I'm quite curious on what it is! 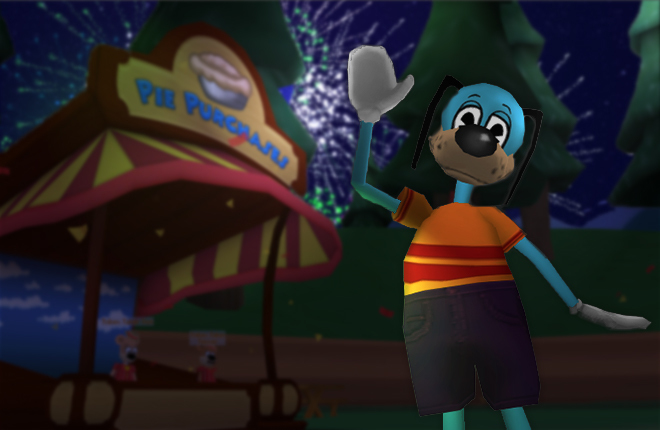 Happy ToonFest everybody! Toker Taker Ted?? There will be some good prizes. Looking forward to the Hawaiian shirts! Hmm... Can you turn the cream pies into Pumpkin Pies to throw at cogs for Halloween? Why are there no Princess costumes? Boy, I think with all these cool bow ties, we can start using them as gags against Lawbots! Shweet! I'm looking forward to it! Thanks for the prize previews! I bet the multiplier gives you an increase in gag exp. I bet that the multipliers will be Token Multipliers. I'm really exited for the Hawaiian Helper and Multiplier! I can't wait to get those new prizes! They look incredibly awesome! Awesome! I saw the flower pot hat in a video and wondered where I could get one. I want the Hawaiian Shirt to go with my Flunky Backpack so badly! Woo Hoo! Can't wait! Thanks TTR! Let me guess! Your Merry Multipliers are there to multiply our toons' power? Wait! Maybe, it's a multiplier to increase our jelly beans so that we never run out? Or maybe, it will increase our UNITES? I know, i know, you are NOT telling,.. Whatever it is, I have a feeling I'm going to love it ...Thank you TTR and Cheerios! This is my VERY first Toonfest, and I say, bug be gone for the Flower Pot Top! I very much enjoy gardening with my multiple toons, as I'm completely maxed with this one! I can't wait to see what's in store in that tower!!! Teddy Bear, Teddy Bear, Turn around, let me take a look around. Haha!!! AAAAAAAAAAAA i love that flower pot top!! :D can't wait! I hope the multipliers multiply Merits, Cogbucks, Jury Notices and Stock Options because those things are a real pain. ooo look cool cant waite!!!!!!! YESSS!!! BOWS!! :D so fashionable!!!!! I'm ready to spend some tokens!! Merry Multipliers sound interesting, i'm diffidently saving up tokens for that! The new prizes look so cool!! I'm especially excited for the new bow-ties! cant wait to see what the multiplier does!! Ooo! I hope the multipliers also apply to boss promotions! Coolio! love those bow ties! Woohoo! i've always wanted a bowtie! Wow that rabbit looks so cool :) I wish I had a toon like that, but you can't make them with hair, smiling and there is no such color :D Well done!!! 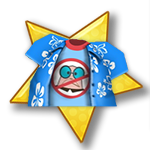 the flower pot hat went unused in toontown online, glad there bringing it back, exited for Hawaiian helper to! The last one looks interesting. Double XP? i want one of the bows! this game is amazing with the toonfests tokens.how do i get toon fest tokens? WOOHOO! I cant wait for new prizes! Sooooo excited!! Better stock up on more tokens! Thank you. I just want to say thank you for making this game possible to play again. 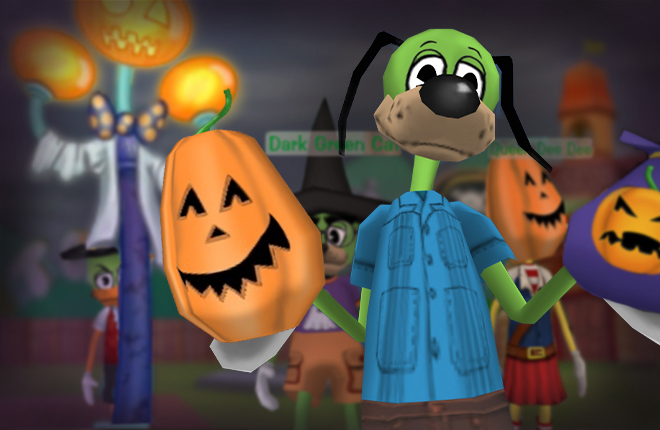 I originally loved Toontown Online, and this version is even better! It may not have everything that Toontown Online had, but it has better things! So, I just wanted to let you guys know, we really appreciate it! Thanks! I cant wait for all of those Merry Multipliers!!! I wonder if they will bring back Dragon Wings or Alien Eyed Glasses! I so wish I had a bigger wardrobe and chest so I could buy everything! ooo so excited! I love toonfest! I love bow ties in real life and now they're in ToonTown, Win win for me. Congratulations for being up for the passed 3 years! I'm suprised disney didn't say anything but I bet you the guy who made it is like. Thank goodness someone thought Imma take the game and release for EVERYONE not some horrible overprice membership that would waste your life. Now you can just waste your life at any interval when playing the game. No stress of oh I payed for 1 year, you guys made it happen. No more membership. Free to play and that's how it should stay. I personally am super excited about bowties!! Nothing I love more than a good bowtie. I can't wait to be the most dapper toon on the block with a brand new collection of these new and *exclusive* bowties. Shame they don't spin, though; I'm a fashionable bunny and I assure you that a spinning bowtie is VERY crucial to my wardrobe! Then comes the question of if I will ever have hair as fabulous as yours, but alas, such a wondrous wig would be to magnificent for my scalp, and I must learn cope without. Phew! My legs are like steel pipes from those trampolines! Hey when that tower gonna open? Wow! I'm really excited for these neat prizes. When is the toonfest tower going to open its doors? Merry Multiplier is probably for toons to multiply something. Can't wait to see what these multipliers will do! The Hawaiian Helper shirt is so pretty! Excited! Cant wait for the prizes! I love you guys so much for bringing back toontown rewritten! Yay! I have 1335 tokens now.. I can't wait to get the bowties, bows and I can't wait to see the Merry Multipliers! :DD I'm sure I have enough to buy the bowties! 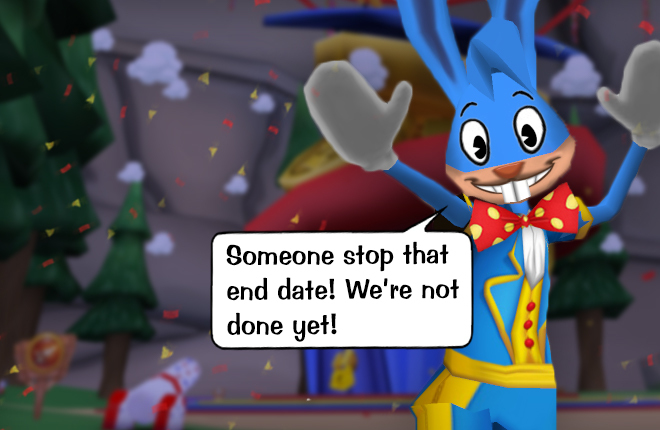 ToonFest: We're Not Done Yet! 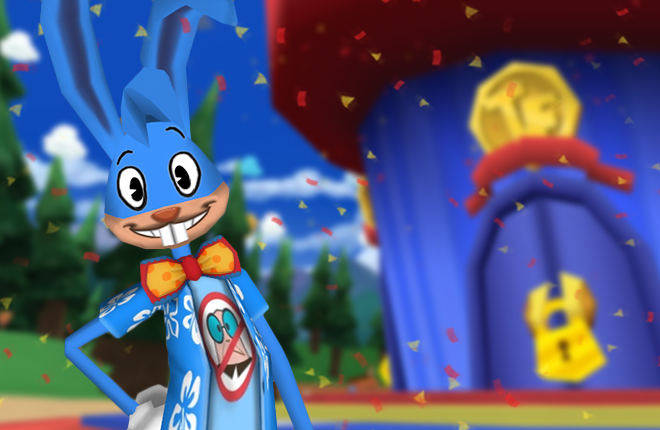 ToonFest: The Party Starts NOW!